This is the perfect solution to Apple Watch users who are traveling. 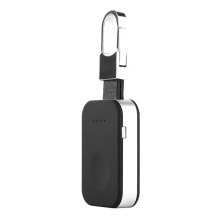 With compact size and portable, you can hook it to your backpack or carry it in your bag or pocket. It is suitable for Apple Watch Series 1, Series 2, Series 3. Keychain design, you can clip it to your backpack, or carry it in your pocket or purse. Compact and portable, great for those who travel a lot or are on-the-go. 4 levels power indicator, representing 25%, 50%, 75%, 100% of the power. Frosted appearance offers you good feeling touch. And with simple and streamline design, the charger is fashionable.